Classic motor yacht Tianca II, currently for sale with CSO Yachts_, is the perfect option for classic yachting lovers, offering her new owners the chance to acquire an efficient, seaworthy yacht with the opportunity to take part in classic rendezvous à la mode, all around the world. Here, we present four reasons why you should own her. _ Tianca II is a sleek and elegant classic motor yacht launched by Chantiers Navals de l' Estérel in 1967. This celebrated yard was known for famous superyachts built in mahogany, like the missed 42-metre Carinthia IV or the 43-metre Acajou (now renamed Sureyya), both designed by the famous duo André Mauric/ Jon Bannenberg. Tianca II is part of a limited series measuring 24.8 metres (26.5 metres including her bathing platform), and few of them are still existing now, even more at this level of maintenance. Her efficient design is also by French naval architect André Mauric. Even if Tianca II will celebrate her 50th anniversary next year, she has only had a couple of owners and was exclusively privately used. Her first owners kept the yacht for 30 years, when she was called Chiriqui II. Her current owners did an expensive refit to maintain her to her former glory. Tianca II is a sleek and elegant classic motor yacht launched by Chantiers Navals de l' Estérel in 1967. This celebrated yard was known for famous superyachts built in mahogany, like the missed 42-metre Carinthia IV or the 43-metre Acajou (now renamed Sureyya), both designed by the famous duo André Mauric/ Jon Bannenberg. Tianca II is part of a limited series measuring 24.8 metres (26.5 metres including her bathing platform), and few of them are still existing now, even more at this level of maintenance. Her efficient design is also by French naval architect André Mauric. Even if Tianca II will celebrate her 50th anniversary next year, she has only had a couple of owners and was exclusively privately used. Her first owners kept the yacht for 30 years, when she was called Chiriqui II. Her current owners did an expensive refit to maintain her to her former glory. 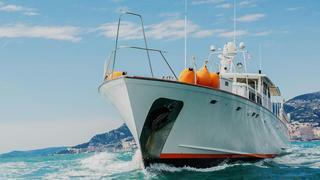 Built in 1967, Tianca II boasts a high quality of construction. Her yard, Chantier Navals de l'Estérel, built numerous fast patrol boats for the French Navy to rigourous standards. Tianca II was built with selected mahoganies: Grand Bassam and Sipo. The cold moulded hull is formed by triple layers of planking fully bonded and adjusted without caulking. And her deck is covered in teak. The rigidity of her semi-planing hull gives Tianca II strong performance. Her original GM engines allow a top speed of 23.5 knots and a perfect stability even in rough waters. Following her refit, her top speed was improved to reach 25 knots. Tianca II's fuel consumption is also impressive, with only 50 litres per engine and per hour when she sails at her cruising speed of 13 knots. Her 5000 litres allow Tianca II to exceed a range of 800 nautical miles. 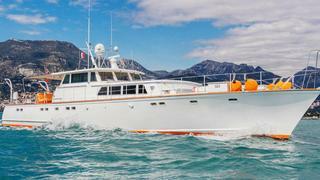 Built in 1967, Tianca II boasts a high quality of construction. Her yard, Chantier Navals de l'Estérel, built numerous fast patrol boats for the French Navy to rigourous standards. Tianca II was built with selected mahoganies: Grand Bassam and Sipo. The cold moulded hull is formed by triple layers of planking fully bonded and adjusted without caulking. And her deck is covered in teak. The rigidity of her semi-planing hull gives Tianca II strong performance. Her original GM engines allow a top speed of 23.5 knots and a perfect stability even in rough waters. Following her refit, her top speed was improved to reach 25 knots. Tianca II's fuel consumption is also impressive, with only 50 litres per engine and per hour when she sails at her cruising speed of 13 knots. Her 5000 litres allow Tianca II to exceed a range of 800 nautical miles. As we all know, owners and guests on yachts many spend their time on the exterior areas. And Tianca II, thanks to her classic design of the 60s, offers outsized exterior areas for a yacht of this size. Tianca II's large aft deck was efficiently updated following her refit, with a large lounge area followed by a dining corner protected by the wheelhouse. All the after deck is protected by a large bimini. 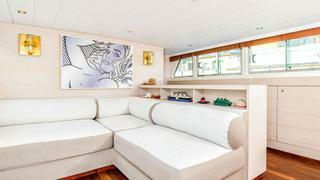 You find again this feeling of space on the foredeck, with an outsized solarium coupled with another lounge corner. You will find the same feeling of space inside. 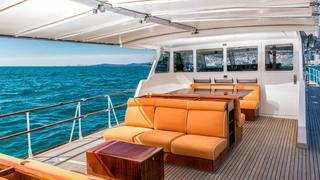 The wheelhouse offers a fantastic 360 degrees view on the sea, another atypical point for a yacht of this size. The owners have decided to remove the dining area inside; instead, you will find a large lounge area. All owner and guest accommodation for six are aft of the lounge area, composed of a double and a twin cabins, and a full beam master suite. Crew space for two is forward with the galley and independent access from the foredeck. As we all know, owners and guests on yachts many spend their time on the exterior areas. And Tianca II, thanks to her classic design of the 60s, offers outsized exterior areas for a yacht of this size. Tianca II's large aft deck was efficiently updated following her refit, with a large lounge area followed by a dining corner protected by the wheelhouse. All the after deck is protected by a large bimini. You find again this feeling of space on the foredeck, with an outsized solarium coupled with another lounge corner. You will find the same feeling of space inside. The wheelhouse offers a fantastic 360 degrees view on the sea, another atypical point for a yacht of this size. The owners have decided to remove the dining area inside; instead, you will find a large lounge area. All owner and guest accommodation for six are aft of the lounge area, composed of a double and a twin cabins, and a full beam master suite. Crew space for two is forward with the galley and independent access from the foredeck. When Tianca II was extensively refitted in 2011 in La Ciotat, she was given an overhaul of both her technical elements and interior design. On the equipment side, two new Volvo Penta D11 engines were installed, giving 100 extra horse power to the yacht and reducing her fuel consumption. The existing Kohler generator was rebuilt while another new one was installed in the middle of the yacht to reduce vibrations and noises in the owner/guest accommodations during the night. The thruster, fridges and air conditioning systems were also upgraded. The interior was entirely re-designed by Martine Cazes in collaboration with the owners. She gave a 70s' touch to the yacht, with the omni-presence of the orange colour. Exterior furniture follow the same theme, creating a link with the interior décoration. Finally, in 2015, the tender to Tianca II was replaced. When Tianca II was extensively refitted in 2011 in La Ciotat, she was given an overhaul of both her technical elements and interior design. On the equipment side, two new Volvo Penta D11 engines were installed, giving 100 extra horse power to the yacht and reducing her fuel consumption. The existing Kohler generator was rebuilt while another new one was installed in the middle of the yacht to reduce vibrations and noises in the owner/guest accommodations during the night. The thruster, fridges and air conditioning systems were also upgraded. The interior was entirely re-designed by Martine Cazes in collaboration with the owners. She gave a 70s' touch to the yacht, with the omni-presence of the orange colour. Exterior furniture follow the same theme, creating a link with the interior décoration. Finally, in 2015, the tender to Tianca II was replaced.